Key to building consensus on the case for change is identifying and targeting the ‘mobilisers’ (or ‘challengers’) within your customers - focusing on job titles alone could harm your chances. Note: I tend to think of mobilisers as the ‘movers and shakers’ that are hard to impress but, if you get them on board, they’ll promote change (and in due course, your solution) within their organisation. ‘Collective learning’ by the decision-makers is needed and the supplier needs to find a way to make this happen: often this will be through facilitating groups on 'why change what you do' and commercial coaching of your mobiliser buyer. Note: this is the most complex part of the book and the area most companies will struggle with. Will their Sales people be capable of this and, for instance, are specialist pre-sales consultants needed? Challenge your customers on where their current thinking is wrong – presenting totally new ideas will have a lower relative chance of getting them to change how they manage part of their organisation. Overall thoughts? The Challenger Customer follows the CEB approach of using deep research and producing counter-intuitive findings that make you reconsider what's best for your company. The core message is don’t just ‘get in earlier’, but, get in earlier with the (not always obvious) right people, focus on individual and group needs to get consensus, and arm your ‘mobiliser’ contact to influence sceptical colleagues. In my extensive experience of advising companies on trusted adviser models, two of the largest issues raised by those implementing Challenger selling concepts are that a) creating highly differentiated insights is too hard and b) adoption efforts run out of steam. This has resulted in some organisations trying, but then turning their back on this approach, or struggling along hoping they can still succeed.The Challenger Customer acknowledges these hurdles and, of course, has added a range of 'new' issues for Sales & Marketing to deal with. Some companies may question whether they can take on more change; instead, they will want to get better with the fundamentals of leading with insight and engaging executive decision-makers. 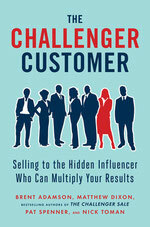 However, those that have successfully embedded Challenger selling will find this book a useful tool when considering what else to adopt.